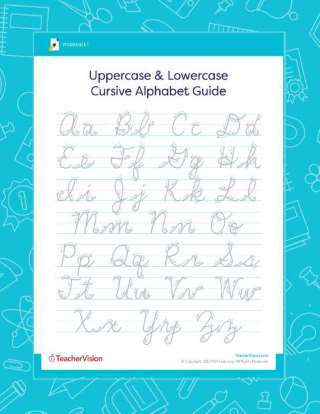 Help students learn and practice writing the alphabet using cursive letters with this printable worksheet featuring both a traditional uppercase and lowercase alphabet. Lowercase letters are featured on the first page and uppercase letters are on the second page. Each letter includes directional prompts and is arrayed on a standard ruled line, including mid-line, for proper height and placement. Either for print or use with an iPad, this worksheet is a great tool to help learners practice how to write the alphabet using cursive letters. You can also use our printable cursive writing workbook for practice with individual letters. While your students may depend on a device, such as an iPad or laptop to complete homework or write essays, there are many benefits for them to learn letter formation using the cursive alphabet. According to studies, writing in cursive activates different parts of the brain than printing letters, and can improve a child's fine motor skills. Studies also suggest that writing in longhand and cursive helps children retain more information and more easily generate ideas. We hope your students enjoy using our guided writing worksheet to learn writing both uppercase and lowercase letters.